Tea Carts are traditionally made for ease in serving in separate locations. For those who don’t have a handy outdoor kitchen, meals are carted from an indoor kitchen to outdoor an dining area, but how? That’s when a two-level teacart comes in handy, as you may easily wheel out your utensils, drinks, food, garnishes and other necessities neatly. Tea Carts have also come to be used as display or storage space, like for a display of towels that sits poolside or bathroom storage for towels and soaps. Whatever your intended use for the Newport Tea Cart, fear no exposure to winds, rains, UV rays or other elements. 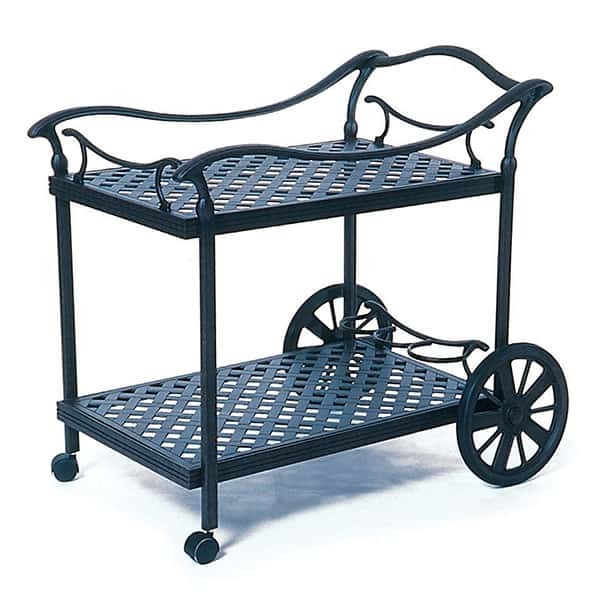 The Newport Tea Cart is made with the Hanamint trademark cast aluminum construction and features a five-step powder coating process for extra protection. As Hanamint believes deeply in the durability of their furniture, they offer a generous 10-year warranty to back up the Newport Tea Cart.